It should come as no surprise that this has increasingly become one of the most common if not the most common form of breach of contract as the economy has continued to falter. Some customers have professed their desire to pay your bills, but "they just don't have the money right now." More often, these non-paying customers will duck your calls altogether. This leaves you in a really awkward position: If you aggressively pursue the money you're owed, you are likely going to alienate someone who may have been a loyal customer for many years; on the other hand, you need to get paid as well. After all, you also have bills to pay. Lots of them. 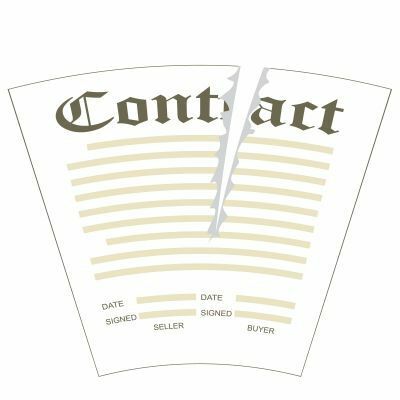 If you decide to try to recover your fee through a breach of contract lawsuit, it is imperative that you assess beforehand whether a judgment against the defendant (your former client) will ultimately be collectible. Stated differently, if you win your case outright, and the court finds that you are owed your entire fee, you may be left with a truly Pyrrhic victory, for an uncollectible judgment is essentially worthless. And in that event, you will be worse off than before. "How is that?" you ask. Because you will have spent time, aggravation, and thrown good money (on lawyers) after bad. There is a silver lining in all of this, though. If your lawyer tells you all of this up front, and suggests that you cut your losses and move on, chances are he/she is a keeper, if not for this case, for the next one. Because it means they knew enough, had enough experience, and had the integrity to tell you the truth up front, despite knowing full well it may cost them a nice fee. 1 Comments to "When You Aren't Paid for the Work You've Done in New York"
Freelancers that don't have the bigger corporate structure behind them, and who are hired sometimes for one-time projects, can be especially vulnerable. Prudent to get agreement both verbally, if the amount is significant enough, and in written form (email). A deposit also helps minimize potential loss. There may be other forms of coercion - legal and non-defamatory - that can help combat instances of non-payment, and even after a judgement has been rendered. Of course if the amount is significant, the defendant might prefer to absorb almost anything and keep the money. Post a Comment to "When You Aren't Paid for the Work You've Done in New York"